Construction took about 2 years. Inside area is about 230 sq. ft. (22 sq. meters), plus a sleeping loft bringing the total to about 325 sq. ft. (30 sq. meters). The foundation is rubble trench, about 4 ft. deep (below frost line). The stem wall is about 2ft. high, made of urbanite (recycled concrete chunks) and earth bags (polypropylene feed bags rammed with lime-stabilized earth). Walls are cob, about 2ft. thick at the base, tapering to 18 inches. The outside walls are plastered with lime. The inside are plastered with an earth plaster (kaolin clay, manure, sand, wheat paste), and painted with a home made milk-protein (casein) paint. Floor is poured adobe (well, basically the same stuff the walls are made of), sealed with boiled linseed oil and beeswax. Solar electric, wood stove for heat, gas (propane) refrigerator, hot water and cook stove. We hired someone to do the roof, but the rest of the house was done by us, with some help from friends. 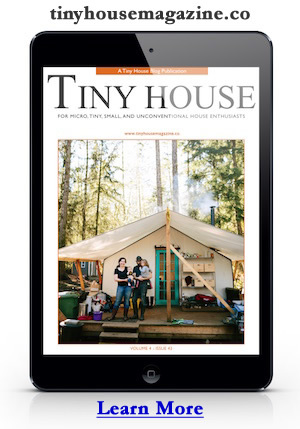 This entry was posted in Tiny House Projects and tagged Arizona, cob house, earthen, tour. Yep – looks like something that you would just mould into – like a hobbit house, except out on the plains. Love those buttress walls, with the sitting spots at the bottom – perfect spot for a sun trap. If you added ochre above the white paint, it looks very like a traditional Tibetan home. NICE. Does not seem as if the awnings give much shade. Would it have helped if the house was turned slightly? I would want my patio area to be in the shade. Love the roof line- solid narrative. Love the stonework too. Wish we could have seen the interior though! Nice place – looks like a great job – am still hoping to do something like this for me after 15 years! Click on the embedded video to go to the youtube.com page, then click on the username of the poster, there you will find two interior videos, one after construction and one after they have been living in it for a bit. Trust me, its worth it. The house is as beautiful on the inside as it is on the outside. found your site recently and have since been obessively looking at nearly every wonderful post. it inspired me to start looking into building an aldo leopold-esque type of weekend shack for my family myself. i came across this 5 acre parcel near the chequamegon-nicolet national forest and chippewa river in wisconsin with a couple of incomplete cob dwellings. Totally cool! Great find Mike!